In our entry-level course, Hydroponics 101 we defined hydroponics and showed you 21 amazing benefits from growing hydroponically. Here we outline for you the ways hydroponic and soilless gardening systems are being used commercially, scientifically, or in other large-scale capacities. We’ll have a look at entire industries, communities, and even schools who are using the soilless growing systems. Vertical Aeroponic Garden at O’Hare International Airport. Photo courtesy of GreenRoofs.org. The entire global industrial and commercial construction industry has been revolutionized by the advancements in hydroponics. 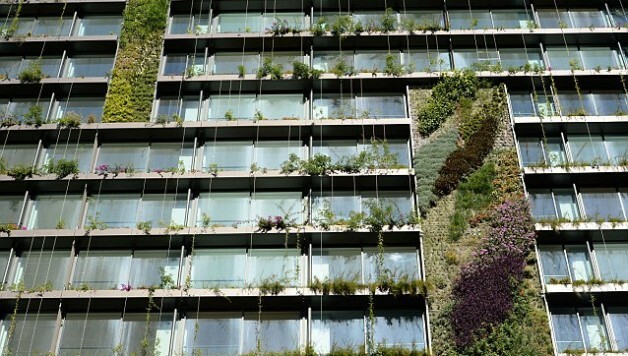 Buildings are now incorporating into their designs entire infrastructures of vertical farms and botanical displays that operate and are maintained hydroponically. Such buildings incorporating soilless gardening systems include airports, condos, restaurants, office buildings, universities, and various other commercial developments. O’Hare International Airport in Chicago is one airport in particular that has embraced this type of soilless farming and offered it up as added value to its visitors. Promoted as a great place to relax, the indoor farm also grows food that is used in the airport’s restaurants. It also boasts the honor of the world’s first airport containing an aeroponic garden– a type of soilless gardening system whereby the plants’ roots are suspended in air. Community gardens using hydroponic systems are another growing trend in local food production. Many charities programs are also using the soilless gardening methods to grow food for low-income families and underprivileged and undernourished children in urban areas. An example of one such community garden is El Jardin del Pueblo in Brooklyn, New York. This greenhouse garden which includes dozens of raised garden beds and a barrel for harvesting rainwater was developed by Cypress Hills Local Development Corporation and will aim to employ inner city teenaged school students and feel local families in need. 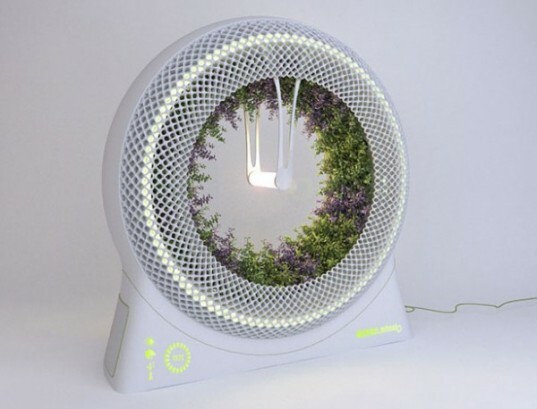 Green Wheel hydroponic gardening system inspired by NASA research. Image courtesy of Inhabitat.com. Another way hydroponics and science are being combined is through NASA. The space program believes that hydroponics and other forms of soilless gardening systems could potentially feed astronauts for longer periods of time as mission lengths will be increasing. Additionally, the plants will provide better air quality to the astronauts by removing carbon dioxide. NASA has created many prototypes, including a rotary frame that would nourish plants from the astronauts’ carbon dioxide and liquid waste, and would as a result provide them with food, oxygen, and water. Though nothing has been perfected yet they still believe that the soilless gardening systems could be the answer. Hydroponics has come a long way in terms of scientific advancements that could provide cost effective solutions to the many food production problems we face today. However, hydroponics can still be a simple and fun system we recommend incorporating into any household. This is the future of soilless gardening. Check out this DIY article on three different ways to build a home hydroponics system. Feature Image: Vertical Hydroponic Gardens grow up the side of a Sydney apartment building. Photo by James D. Morgan for Rex Features.